Employers from Northern Ireland and as far away as Australia were honoured by the University of Ulster last night at a gala ceremony hosted by TV presenter, Claire McCollum. 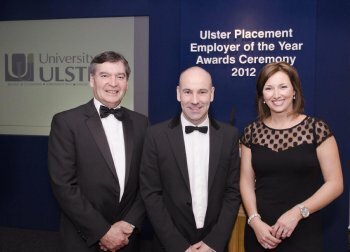 The University of Ulster Placement Employer of the Year Awards 2012 took place on the Jordanstown campus and was attended by 100 leaders of local and national enterprises. The annual event, now in its fourth year, recognises the University’s placement partners’ contributions to student employability through work-based and placement learning. Nineteen finalists in six categories were selected after employers in the public and private sectors and University of Ulster students and staff, were invited to nominate placement partners that have provided exemplary student experience during the 12 months leading up to the 1 February 2012 deadline. More than 140 nominations were received this year which clearly indicates the continued value all stakeholders place on experience in the work environment, the calibre of University of Ulster students and the importance the University places on preparing students for a successful professional career. Speaking at the awards, University of Ulster Vice Chancellor, Professor Richard Barnett, said: “Ulster is recognised locally and nationally for its high quality professional and vocational education. “Its suite of taught programmes is characterised by a focus on the application of theory to practice and the provision of opportunities for students to undertake Work-Based Learning (WBL) and to study for coterminous awards. “The development and promotion of WBL at Ulster is central to our corporate plan and underpins the teaching and learning strategy. Our aim is to provide our graduates with the knowledge, skills and confidence to take on challenging graduate-level jobs, and then to contribute to the further development of their chosen profession. “I am delighted once again at the breadth and diversity of the organisations and industry sectors represented in this year’s competition. “It is evident in graduate recruitment practice both locally and nationally, that students gaining graduate level jobs have enhanced their employability through work experience while at the University of Ulster. 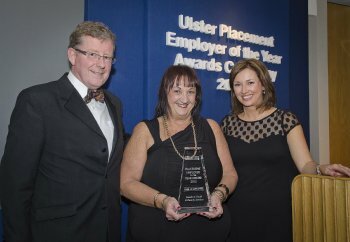 Accepting the award for Placement Employer of the Year (more than 50 employees), Narelle Clay, Chief Executive Officer of Southern Youth and Family Services, praised the University of Ulster WBL scheme and the calibre of students who travel to Australia for work experience. She said: “For more than 10 years the Southern Youth and Family Services has partnered with the University of Ulster to provide work-based learning, as a result, we enjoy a unique and very special relationship with the University. The University of Ulster is one of the top six providers of sandwich placements within the UK. Students cite the inclusion of WBL opportunities as a reason for applying to their programme of study. Annually more than 2000 students undertake a placement, with approximately 1200 of these undertaking a year-long paid placement. Research at the University of Ulster, and also nationally, has demonstrated that placement is extremely valuable to students, both in terms of their academic performance and their ability to gain a graduate level job on first leaving university. 2012 Wilson Review - ‘Business-University Collaboration’ highlighted Ulster for having a strong tradition of workplace learning. The University of Ulster offers students opportunities to complete work placement abroad or to study abroad through programmes such as ERASMUS and Study USA. In association with high profile employers, The University of Ulster offers 35 internships to our graduates. These consist of an academic qualification (Grad Cert. Professional Practice) and a six-month work placement. The University of Ulster has invested significantly in its provision of work-based and work-related learning for its students, with the aim of having these opportunities available to all students. In addition to practical work experience, The University of Ulster offers opportunities for co-curricular activities which support student learning, these include: Tutoring in Schools, the Edge award and Science Shop.